Glass harpist Petr Spatina (40) was born in Šumperk, a town and district of the Olomouc Region in the eastern part of the Czech Republic. Spatina was born into a farming family; his father played the accordion and guitar and his mother played the accordion. Petr's musical career started at the age of 7 when he learned to play the piano by himself. His mother taught him the accordion. He has been playing these instruments, until he found the instrument of his soul: a unique glass harp, which he masters like no other and is only played by a few people in the world. Spatina has been playing the glass harp for more than 20 years now. Over the years he developed his own playing technique. The instrument consists of 32 wine glasses, filled and tuned with distilled water. He plays it by dipping his fingers in the water, sometimes striking, sometimes stroking the glass rims, like the keys of a keyboard. From a plumber to a glass harpist. The Czech glass harpist creates the most beautiful, angelic sounds. Before performing as a glass harpist, Petr was a self-employed plumber. However music-making on glasses increasingly captivated him. He does not play much modern music because the glass instrument cannot produce the basses and beats of typical of modern music. The nature of the instrument means Petr can only play melodic music. Petr plays mainly classical music on his glass instruments such as 'La Campanella' by Franz Liszt and 'An der schönen blauen Donau' by Strauss or composes the music by himself. In order to develop his musical abilities he rehearses about 5 hours a day at home. Gradually he extends his repertoire and adds more classical works. About ten years ago, one of his first compositions and musical performances on the glass harp was entitled 'Zerbrechlicher Klang' ('Fragile Sounds'). Petr describes himself as an artist with a sensitive heart. "My father showed me that it is easy to produce sounds out of glasses by running your fingers over the rims. That fascinated me, although everybody knows that this creates extraordinary sounds. I practiced more and more, gradually developing a technique and at the age of 16, I started playing in bars and clubs. I found it so amazing that I left my work as a plumber and became an artist." As a former plumber, he felt he needed to work with water, but in another way, different from the usual plumbing. After his father had taught him how to produce sounds out of glasses at an early age, he used his imagination to gradually play on more glasses at the same time, creating ther most incredible melodies, evocative of a harmonium made of glass. 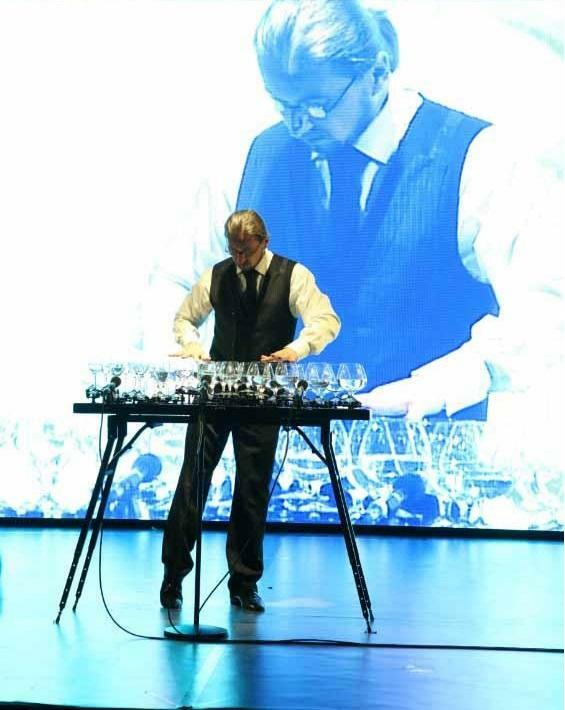 Spatina made his instrument himself, using 32 wine glasses mounted on a hand-made table, filling them with distilled water to produce notes with a variety of high and low tones. 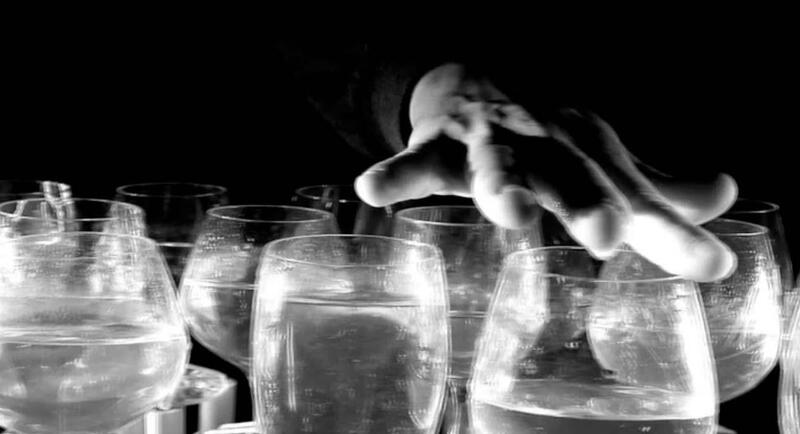 A glass harp - also called singing glasses, angelic organ or verrillon - is a musical instrument consisting of upright wine glasses filled with water. It is played by running moistened or chalked fingers around the rim of the glasses to create the notes. Each glass is tuned to a different pitch, either by grinding the goblet to the specified pitch, in which case the tuning is permanent, or by filling it with water until the desired pitch is achieved. Many people seeing for the first time wine glasses used as a musical instrument, feel it to be unusual, even unique but in the Far East glass instruments were already known as far back as the Middle Ages. "When I play it sometimes feels as if the world around me disappears." Petr Spatina finds it amusing that his life as a plumber has been changed into that of a musician. The Czech glass artist acquired international fame over the last years. Sometimes he cannot believe this fairy tale that is happening to him but he enjoys every moment. Petr: "It is an incredibly sensual experience. It is as if the world around me disappears and I am immersed into a completely different world. It is like magic." Petr Spatina checks the tone of each glass beforehand and is always looking for good glasses as not all glasses can be used as musical glasses. Before starting, he determines the amount of water and fills the glasses using a very large syringe. In order to create the right sounds he first has to wash his hands and wet his fingers. The shape of the instrument has evolved over the years into the current design. In the beginning it took over three years, while Petr constantly improved the instrument until he was happy with the result. The spherical sound of his crystal music is beguiling. His audiences become enthralled by the unique harmonious sounds of his enchanting performances and are transported to another sphere by his amazing technique. Spatina's outstanding way of playing on glasses creates subtle reminiscent of the triangle. Becoming entranced in the performance, he moves like a ballet dancer, his arms and fingers gracefully bringing to life the rhythms of the glasses. Over the past 10 years Spatina has built a worldwide reputation, especially through stunning TV performances. In January 2012 he was invited to play at the Jonathan Ross Show in the UK and completely astonishing the audience. He has also performed in Amsterdam, Barcelona, Vienna, Moscow, Abu Dhabi, Dubai, Seoul, Milan, Istanbul, China and Germany and has been booked by international event agencies and major companies. He also played for two European feature films. Spatina even performed Halleluya by Leonard Cohen on the glass harp. In Barcelona he performed together with a ballet dancer. At the moment one can see Petr all over South Korea in an advertising campaign for Canon and he has several concerts in Seoul. In October 2013, he produced his first two CDs entitled 'Goodwater Classics' and 'Goodwater Sphere'.